I See a Darkness is the sixth album by American musician Will Oldham, released on Palace Records on January 19, 1999 as the first album under the name Bonnie "Prince" Billy. The album features appearances from Bob Arellano, Colin Gagon, Paul Oldham, David Pajo, and Peter Townsend. I See a Darkness received generally positive reviews from music critics. Samir Khan of Pitchfork described the album as Oldham's "consummate offering" and the "type of record that demands solitary reverence". Gregg Rounds of AllMusic wrote that it showcased "a more melodic style than the veteran Palace listener might be used to", while at the same time noting that Oldham "hasn't abandoned his foundation of mordant lyrics and minimalist arrangements, but he has built a variety of different layers that make this album an emotional and pleasurable listening experience". The A.V. Club's Stephen Thompson remarked that I See a Darkness was the "most appropriate synthesis yet of Oldham's vocals and backing band". Simon Williams of NME was more reserved in his praise of the album, advising listeners that "patience is a virtue" while nonetheless calling it a "delicate, intelligent record". I See a Darkness has been ranked in several publications' lists of best albums. Pitchfork ranked it the ninth best album of the 1990s. In 2004, Stylus Magazine placed I See a Darkness at number 171 on its list of the 200 best albums of all time, while in 2006, Mojo deemed it a "modern classic" and the twentieth best album released during the magazine's lifetime. The album was also included in the book 1001 Albums You Must Hear Before You Die. In 2002, Matt LeMay of Stylus Magazine wrote that "by addressing concepts so grand with such sincerity and skill, the album is incredibly powerful under even the most mundane of circumstances". Reviewing its 2012 reissue, Aaron Lavery of Drowned in Sound called I See a Darkness Oldham's "finest achievement thus far" and the "essential release" in his discography. Q cited the album as "his masterpiece, ushering in a direct and less mythic style of songwriting". Johnny Cash recorded the titular track on his 2000 album American III: Solitary Man, with Oldham providing background vocals. Steve Adey also covered the title track on his 2006 album All Things Real. All lyrics written by Will Oldham, except "Song for the New Breed" by Dianne Bellino; all music composed by Oldham. ^ "Bonnie "Prince" Billy, 'Beware' (Drag City)". Spin. February 19, 2009. Retrieved July 23, 2018. ^ a b Rounds, Gregg. "I See a Darkness – Bonnie "Prince" Billy". AllMusic. Retrieved July 10, 2015. ^ James, Gareth (July 23, 2012). "Bonnie 'Prince' Billy – I See A Darkness". Clash (76). Retrieved April 7, 2013. ^ a b Lavery, Aaron (July 27, 2012). "Album Review: Bonnie 'Prince' Billy – Arise Therefore; Joya; I See A Darkness (reissued)". Drowned in Sound. Retrieved April 7, 2013. ^ Trew, Jonathan (December 17, 1998). "Bonnie 'Prince' Billy: I See a Darkness (Domino)". The List (349): 54. Retrieved March 4, 2017. ^ a b Williams, Simon (January 25, 1999). "Bonnie Prince Billy – I See A Darkness". NME. Archived from the original on August 17, 2000. Retrieved April 7, 2013. ^ a b Khan, Samir (September 30, 1999). 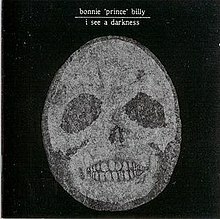 "Bonnie "Prince" Billy: I See a Darkness". Pitchfork. Retrieved July 10, 2015. ^ a b "Bonnie "Prince" Billy: I See a Darkness". Q: 113. 2012. ^ Young, Rob (July 9, 2012). "Bonnie 'Prince' Billy – reissues". Uncut. Retrieved July 10, 2015. ^ Thompson, Stephen (January 19, 1999). "Bonnie 'Prince' Billy: I See A Darkness". The A.V. Club. Retrieved May 16, 2015. ^ "Top 100 Albums of the 1990s". Pitchfork. November 17, 2003. Retrieved April 7, 2013. ^ "Top 101–200 Favourite Albums Ever". Stylus Magazine. March 22, 2004. Archived from the original on December 14, 2005. Retrieved April 7, 2013. ^ "The 100 Greatest Albums of Our Lifetime". Mojo (150): 65. May 2006. ^ LeMay, Matt (September 2, 2002). "Stranded: I See a Darkness". Stylus Magazine. Archived from the original on January 14, 2010. Retrieved April 7, 2013. ^ Beckett, Colin (September 1, 2003). "Johnny Cash – American IV: The Man Comes Around – Review". Stylus Magazine. Archived from the original on February 1, 2010. Retrieved April 7, 2013. ^ Mathers, Ian (July 6, 2006). "Steve Adey – All Things Real – Review". Stylus Magazine. Archived from the original on February 1, 2010. Retrieved April 7, 2013. ^ "Chart Log UK: Darren B – David Byrne". Zobbel.de. Retrieved July 23, 2018. ^ "Official Independent Albums Chart Top 50". Official Charts Company. Retrieved July 23, 2018. This page was last edited on 11 December 2018, at 09:53 (UTC).